As controversy currently surrounds the appointment of a judge to the Supreme Court of the United States, the ease with which a new President of the Caribbean Court of Justice (CCJ) was installed on July 4, without any political involvement, should be cause for pride in the Caribbean. In the United States, justices of the Supreme Court – the equivalent of the CCJ – are nominated by the U.S. President but must be approved by the senate. This process has proven to be contentious and protracted. With a presidential election eight months away from President Obama’s nomination of Garland, the Republicans were determined to await the result of the election and the possibility of a Republican president nominating a judge who shared their political thinking. In the last two weeks, another vacancy has arisen on the Supreme Court benches as Justice Anthony M. Kennedy’s announced his retirement. Once again, controversy has arisen over the appointment as the political factions in the US quarrel over the ideological leanings of any nominee by President Trump. This battle, split down political party lines, is expected to continue right up to mid-term elections for the US Senate in November. While this public debate takes place in the U.S. of President of the CCJ transitioned seamlessly with no controversy, and, importantly, no political involvement. 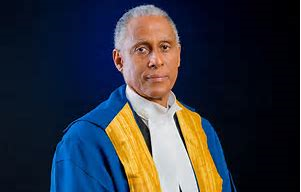 The reason for the seamless transition from Sir Denis Byron to Justice Adrian Saunders as President is that there is no role for governments or political parties in the appointment of justices of the CCJ or the chief justice/President. The search for, and nomination of, the President, and other justices, are carried out by a Commission comprising representatives of the Caribeban bar association, the Law Faculty of the University of the West Indies and other Caribbean public service and legal services organisations. The procedure for selecting and appointing the President/chief justice and other justices of the CCJ underscores the court’s independence from governments and political parties. So far, the Commission charged with the task has done an outstanding job. Like the Supreme Court of the US, which has original jurisdiction over disputes between the states of the United States, the CCJ has original jurisdiction over disputes within the Caribbean Community under the CARICOM Treaty; the CCJ, like the US Supreme Court also has appellate jurisdiction in criminal and civil matters. However, while all CARICOM countries accept the original jurisdiction of the CCJ in relation to the CARICOM Treaty, only five of them have so far acceded to the Court in its appellate jurisdiction.